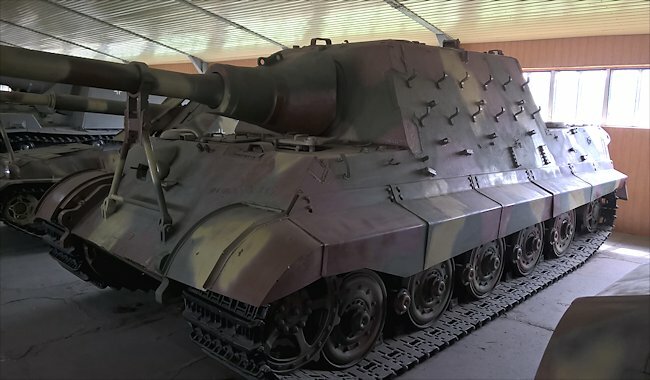 This preserved German Jagdtiger Tank Destroyer can be found at the Kubinka Tank Museum in Russia. 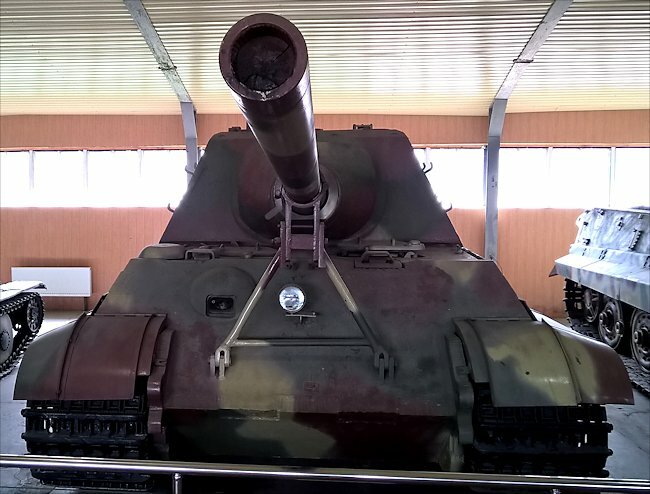 Preserved German Jagdtiger Tank Destroyer at the Kubinka Tank Museum in Russia. Jagdtiger is German for Hunting Tiger It is the common name of a heaviest tank destroyer built in World War II. The official German Army designation was Panzerjäger Tiger Ausf. B Sd. Kfz. 186 as it was based on a lengthened Tiger II tank chassis. It had the ability to out-ranging and knock out any Allied tank. Fahrgestell number 305083, this vehicle was produced in April 1945. According to Wikipedia, it was acquired by Soviet forces when a Kampfgruppe (battle group) of the s.Pz.Jg.Abt 653 (Schwere Panzerjäger Abteilung 653 - Heavy Tank Hunter Battalion 653) equipped with 4 Jagdtigers surrendered in Amstetten, Austria on 5 May 1945. This Jagdtiger was acquired in mint condition with complete side skirts and later 9 tooth sprocket ring. 12 hooks on each side of the superstructure were used to carry 6 pairs of track links. This vehicle was not coated with Zimmerit. The vehicle lost all its tools but retains the MG-42 antiaircraft mount on the rear engine deck. The Jagdtiger was produced between 1944 and 1945 by Nibelungenwerk (Steyr-Daimler-Puch). They built 88 but only three survive. One is in the Bovington Tank Museum based on Porsche running gear (8 road wheels). This tank and the third Jagdtiger at the National Armor and Cavalry Museum, Fort Benning, GA, USA were based on the Henschel Suspension system (9 road wheels). Its main armament was a large 128 mm Pak 44 L/55. It had one hull mounted 7.96 mm Maschinengewehr 34 machine gun. It was powered by a V-12 Maybach HL 230 P30 engine. It produced 690 hp but because it weighed 71.7 tonnes it only had a top road speed of 34 km/h (21 mph). The engine was too weak to power this monster of a vehicle. The weight put tremendous stresses on the transmission and the differentials which continually suffered mechanical failures. This combat vehicle was designed to engage enemy targets from a long range. It was a fatal mistake to get too close to fast moving tanks who could out flank the Jagdtiger and fire at its less protected sides and rear. The 250 mm frontal armour made the Jagdtiger immune from allied armour piercing and HE shells when hit on the front. So long as the tank destroyer commander kept the vehicle pointing at the enemy they were relatively safe from destruction. Unfortunately for the German Army many of the tank crews that manned this mighty weapon were not trained enough to use it to its full potential. Many Jagdtigers had to be destroyed by their crews when they broke down on the battlefield as there was often no method of retrieving them to be fixed. The main threat to a Jagdtiger was from, anti-tank mines blowing off tracks, heavy artillery bombardment, air attack, and from infantry jumping on the back of the vehicle and placing a bomb or Molotov cocktail on top of the engine hatches. Rockets, shells and bombs could penetrate the thinner armour plating on the top of the vehicle but not the front armour.